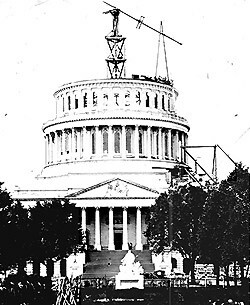 The Capitol Project is an infinitely extensible exploration of the National Capitol as an American icon -- the cathedral of our national faith, the map of our public memory, and the monument to our official culture. At the center of the project stands the Building itself, at once an icon and a remarkable collection of icons -- paintings, frescoes, sculpture, reliefs, architecture, and a miscellany of material objects. In the immediately surrounding area, the Mall, we find an array of competing and/or confirming sites, the Smithsonian Institute and the Holocaust Memorial Museum, for example, the Treasury Building and the White House and the National Portrait Gallery. Finally, beyond the Mall lies the rest of America, for us a vast array of symbolic spaces engaged in continuous dialogue with the Capitol. These include the obvious -- the state capitol buildings in Richmond and Lincoln and Denver -- and the less obvious -- Monticello and Graceland, Disney's Frontier Land and the Carousel of Progress -- as well as some rather unlikely places, the magical garden of Georgia artist Howard Finster or the Historical Monument of the American Republic dreamt and painted by Erastus Salisbury Field. What links them all together -- beyond their wild variety, beyond the cacophony of forms and voices, beyond even their extraordinary fluidity and changeableness through time-- is that each claims to represent our TRUE national culture, our history and our destiny. Finding and explaining these links is our goal -- and also something we'll obviously never accomplish. But, if you enter the Capitol now, you'll see that we've at least made a beginning. begin a virtual tour of the capitol and the different thematic levels of this site. or go to the alphabetical index where satellite projects and sites are listed alphabetically. Return Last updated July 31, 1998.